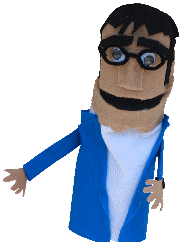 I had just graduated from UCLA's ethnomusicology program and was very tired of academia and putting my own music on the back burner. I was very anxious to record my first album, knowing full-well that my idealism and lack of expearience would leave the album full of mistakes. My mistakes in Jr. high band nearly led me to quit music altogether. 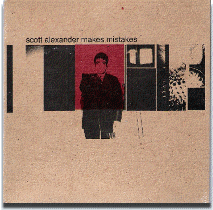 Since then, I have found mistakes not only to deliver invaluable lessons, but they also make for extremely honest and beautiful music. Well, sometimes. This was a bit of a glorified 3 song demo, of which I gave away over a thousand copies. 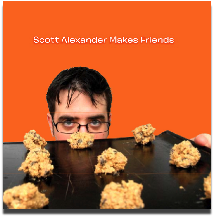 I discovered that I make more friends, however, giving away cookies. 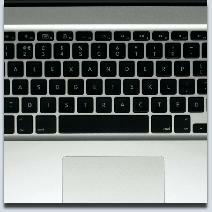 There was a 4th bonus track on my website about National Public Radio, that is no longer available. You snooze, you loose. This third release was recorded entirely in my apartment. 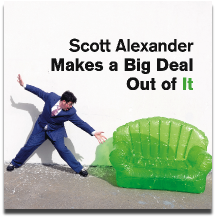 It is the rivalrous sibling to the fully produced studio album, Scott Alexander Makes a Big Deal Out of It (released a few months later). 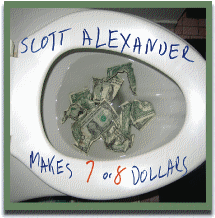 Though this album cost almost nothing to make, the 8 songs were all inspired by money. Aren't we all? My most elaborate and costly production so far. It features several guest performers and producers and resulted in me quitting my day job, as well as a lawsuit that made it's way to The Peoples Court. This project became so important to me that I realized how badly I need to make more friends to share it with. So I started FreeCookiesNyc, giving out vegan cookies on an inflatable couch. It's a great way to meet people. This five-song suite took a hybrid approach to full-scale and DIY production that my previous albums contrasted. Aside from percussion, it was recorded entirely by yours truly in my Oakland apartment but maticulously edited and mixed. This is also my first recording since moving to the West Coast. Though not my most lengthy or expensive endevour, it was certainly the most time-consuming. The theme of distractions may have been a self-fufilling prophecy. Then again, here is a babboon and a bushbaby.